The following letter was sent to Dominican president Danilo Medina urging the immediate cancellation of the announced targeting and deportation of people of Haitian descent, scheduled to take place as early as June 18. We are writing to express our deep concern regarding the impending mass deportations which are scheduled to take place as early as June 18, 2015. At a minimum, the undersigned urge the Dominican Republic to halt its plan to expel thousands of individuals of Haitian descent, and further urge the citizenship reinstatement of those Dominicans of Haitian descent adversely affected by the Dominican Republic Constitutional Tribunal’s ruling No. 168-13, without the arduous and flawed process laid out in Naturalization Law No. 169-14. Furthermore, these laws not only violate international laws and conventions, they also create a harmful xenophobic and racist environment against all dark skinned Haitians in the Dominican Republic. The undersigned call on the Dominican Government to take affirmative steps to quell the wave of xenophobia, hatred and violence against people of Haitian descent. Violent acts against individuals of Haitian descent living in the Dominican Republic have been widely reported on, and the international community is gravely concerned about the potential for the deportations to place anyone suspected of being of Haitian descent in danger for their personal safety. 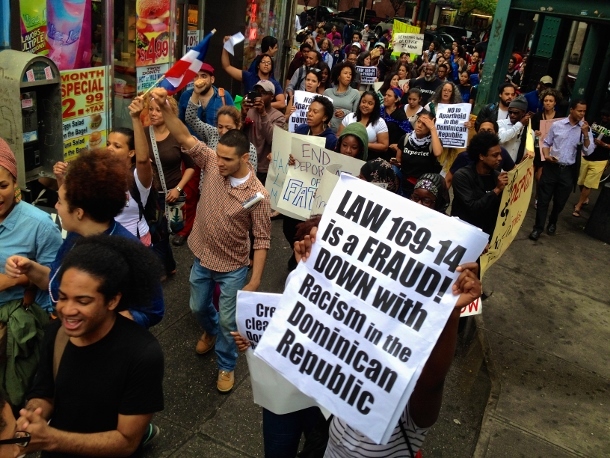 The Dominican government should suspend any mass deportations in the absence of transparency regarding the protocols and in light of the disorganization and clear problems inherent in the registration process under Naturalization Law 169-14. The undersigned are similarly troubled by the lack of proactive response by the Haitian government to advocate on behalf of the Dominicans of Haitian descent and Haitian nationals impacted by this decision. We further urge the Haitian government to ensure human rights protections for every Dominican of Haitian descent and its own nationals living in the Dominican Republic. We thank you for your prompt attention to this matter.